Admiral Nimitz boards Nicholas to present the Presidential Unit Citation, Pearl Harbor, 28 January 1944. Click on any image to view it in more detail. Nicholas was moored port side to King ONE Berth at Pearl outside the DesPac Offices on Friday, 28 January 1944. The ship looked the part that she was—“The Mistress of the Sea.” The officers and men were in the uniform of the day—Service Dress Whites. At 1145, Admiral Nimitz, accompanied by Flag Officers present at Pearl, was piped aboard with full honors including a band to give the ruffles and flourishes. The crew was drawn up on the fo’castle, with those not able to be at quarters there on the dock just below the port bow. Lieutenant Peter T. Kroeger was present with the ship’s officers. “It is very gratifying to me as the new Commander Destroyers, Pacific, to be here at the presentation of the Unit Citation to the USS Nicholas. I regret that your sister ship, the USS Radford, who likewise is to receive the Unit Citation and who was present with you in Kula Gulf on the night of the 5th and 6th of July, could not be in port. “In order to receive a Unit Citation a ship must perform outstanding battle service as compared with other ships of the same type. During the forty years since destroyer Number One, the old Bainbridge was commissioned, the destroyer forces of our Navy have been very proud of their record and to be “outstanding” among these ships has been a distinct accomplishment. To be outstanding among the destroyers of the Pacific Fleet during the past two years is indeed a very high honor and one you should all be proud of. “In reading over the report of the action on the 5th and 6th of July, one thing stands out vary clearly in my mind. “In the nineteen months this ship has been in commission, she has participated in many actions, all of which have reflected credit on herself and on our Navy. I know that you will continue to maintain the high tradition you have established for yourself. “I am proud to present to you a fitting token of the respect and esteem which this ship, her officers and her men have well earned throughout the Navy. “To say the record speaks for itself is not enough. In this case the record of Nicholas is in a sense the record of one entire phase of the Pacific war. She was commissioned in June, 1942—a little more than a year and a half ago. Her initial experience in battle came six months later when she took part in the bombardment of enemy positions on Guadalcanal. She did not get much rest after that. “The turn of the year found her bombarding Munda Air Strip on New Georgia Island. Just as that action was over, she fought off a heavy enemy air attack. Shortly thereafter, in company with other destroyers, she laid down a heavy bombardment on the Vila-Stanmore plantation on Kolombangara Island in the Solomons. “During February she was busy helping derail the ‘Tokyo Express’, which was trying desperately to reinforce Guadalcanal. “March found her paying return visits to Munda and Kolombangara, shelling enemy positions. “On April 7, Nicholas was again off Guadalcanal, her batteries contributing to the fire-power that repulsed an enemy air attack with the destruction of some 75 of the enemy’s planes. “On May 12, Nicholas once again bombarded Kolombangara. Early in June, defending a heavily-laden tanker, she fought off an enemy air attack and knocked four of the planes out of the sky. On July 4, she supported with gunfire the Marine Landings at Rice Anchorage, on New Georgia. “Had the war record of Nicholas closed at that point, it still would have been an impressive one, but Nicholas had not yet begun to fight. “The next night, July 5, she led the Allied battle line into the first battle of Kula Gulf and later, in company with the Radford, effected the hazardous rescue of the Helena survivors, earning the recognition which resulted in the decision to award her the honor she is to receive today. “To Nicholas, it was just another night’s work. “A week later, she again led the Allied battle line down Kula Gulf against a powerful enemy force, and again the enemy was decisively defeated. “And later the same month, supporting operations at New Georgia, she shot down another batch of enemy planes. “This record which speaks eloquently for itself, is only slightly better than that of many another destroyer which participated in the war in the South Pacific. With little time to rest or to overhaul, and with a great variety of missions to accomplish, our destroyers, generally, have performed magnificently, and with little of the publicity which has accompanied the exploits of other units of the Naval Service. Our destroyers have truly been the silent part of our service, but their exploits and their capabilities are well known to those who have to know. “Congratulations from the Pacific Fleet to every officer and man of Nicholas. Well done! Captain Keith stepped forward and accepted the citation and pennant on behalf of the ship. 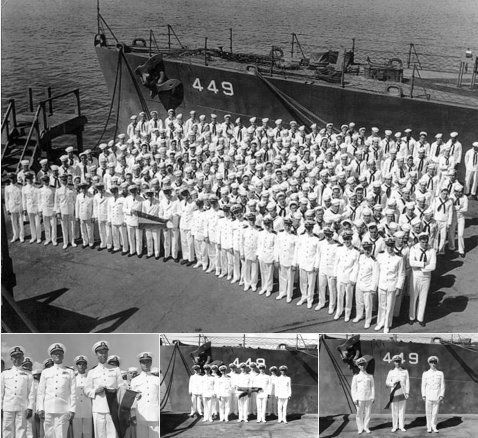 Upon the completion of the presentation, the National Anthem was played after which Admiral Nimitz posed for photographs with the officers and men of the ship. Admiral Nimitz and the other ranking guests were piped over the side. It was a great show for a noble ship who has done more than her share to help bring this war nearer to a victorious close. Double click anywhere to return to the top of this page. Copyright © 2000-2019 Destroyer History Foundation for USS Nicholas shipmates. Website development by Nolee-O Web Design.